I’ve long had a river cruise along the Rhine on my European bucket list. Unfortunately I do not have the best attention span and could never commit to the leisurely 4-5 hour trips. Luckily, I recently discovered that one can take a shorter ride down the river through one of two companies. 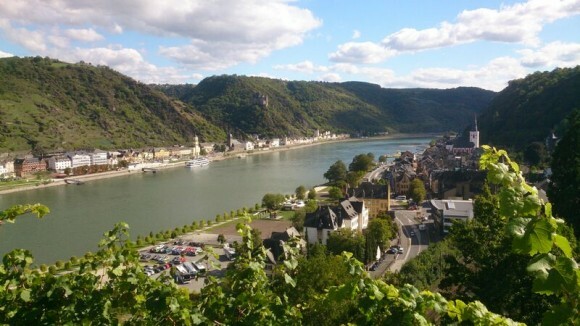 We drove to Bacharach, hopped on a boat and rode the Rhine for about 40 minutes to St. Goar. We chose to cruise the Rhine on the larger Koln-Dusseldorfer cruise line, although there is also the slightly less expensive Bingen-Ruedesheimer cruise line. You can purchase tickets for either boat at the dock the day of travel. K-D cruises have a ticket office where you can purchase tickets up to 5 minutes before the boat departs. 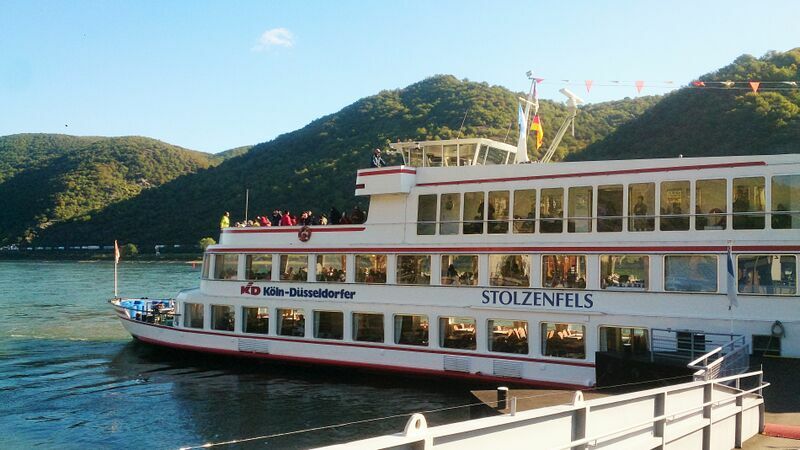 Bingen-Ruedesheimer has someone available about 5 minutes before the boat is scheduled to depart. Both lines speak many languages, including English, and can answer any questions you may have upon arrival. 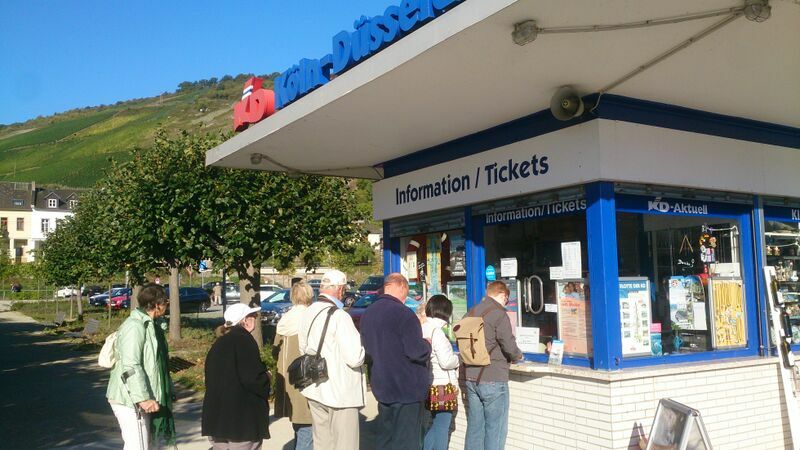 Our roundtrip tickets on K-D from Bacharach to St. Goar were about 15 Euro per person. You can find timetable and price information for K-D cruises on their website. 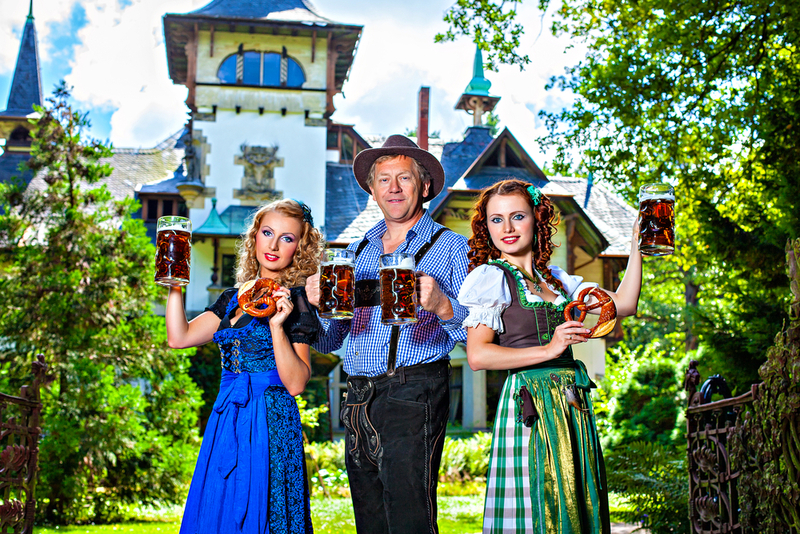 Bingen-Ruedesheimer’s timetable and price list is available on their website. Bacharach is a charming and picturesque village with cafés, restaurants, and of course a castle (Burg Stahleck), and church (St. Peter). There are also many charming hotels for out of town visitors. Be sure to spend time exploring the town before or after heading on the cruise. Some further information on the town can be found here. We arrived in St. Goar around lunch time, so our first order of business was to stop at one of the restaurants situated on the water and have a beer and traditional German food. 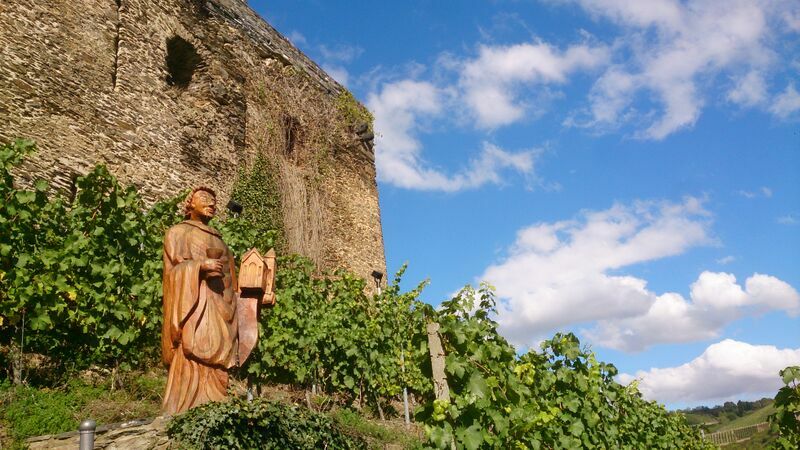 Once rejuvenated, we made the trek up to Rheinfels Castle. (Maps of the town are available at the tourism office). Tickets for entrance into the castle (5 Euro for adults, 4 Euro for students over 15, and 2.50 Euro for children 6-14) include a map in English with a self guided tour. Inside the castle, you can even walk in the old mining tunnels- a spooky and fun experience. 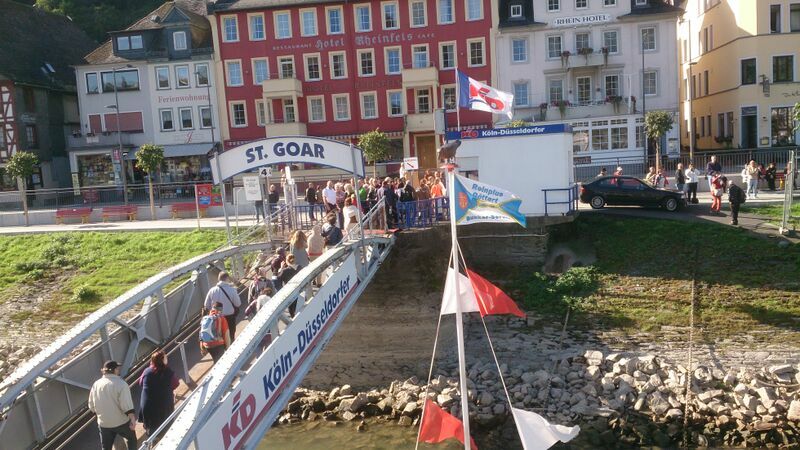 More info on St. Goar can be found here. 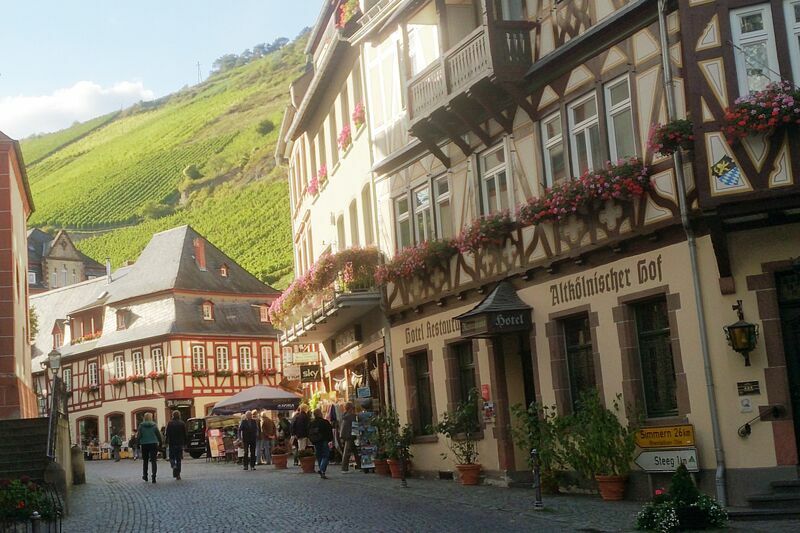 Bacharach is located just over 1 hour from Kaiserslautern, 3 hours from Stuttgart, and 45 minutes from Wiesbaden. For train information, visit DB Bahn.